Description: Sexes similar. 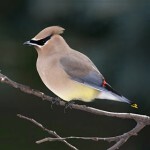 Grayish-brown head, crest, back, and breast; black mask and chin; grayish-black wings; yellow belly; white undertail coverts; and yellow terminal tail band. Lacks yellow spots on wings. 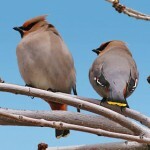 Smaller and browner than Bohemian Waxwing. Juvenile is streaked. Behavior: Outside the breeding season, flocks concentrate in fruit-bearing trees. Habitat: Breeding occurs in semi-open deciduous woodlands, floodplain forests, and sometimes parks, farmsteads, or residential areas. Where in Nebraska: Common spring and fall migrant across the state, and an uncommon winter resident. Timing of migration is erratic, and is probably related to the availability of food. Uncommon breeder in Nebraska. Field Notes: Highly gregarious during migration and winter. 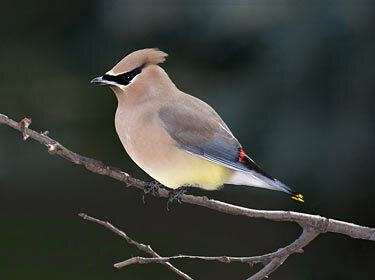 Fun Facts: Cedar Waxwings have such a high fruit diet that they have been known to become intoxicated or even die from eating overripe berries or those that have started to ferment.